Begin with 1lb large raw deveined shrimp. Place shrimp in a large bowl and drizzle with vegetable oil. Finely chop two garlic cloves and add to bowl. Squeeze juice of one large lime and sprinkle with salt, cracked pepper, garlic powder, and cayenne. Toss so that everything is well coated. Let marinate for about ten minutes. Meanwhile, soak your wooden skewers in water so they will not burn over grill. Clean and slice your leeks lengthwise and drizzle with oil. Set aside. If using a whole pineapple, slice top off and then cut into 1/2 inch rings. Cut rings in half creating semi- circles. Cut out pieces of core and set aside. Lance 3 shrimp per skewer and sprinkle again with a little cayenne. If using a grill pan instead of a outdoor grill, heat to med-high. Place leeks on grill first. 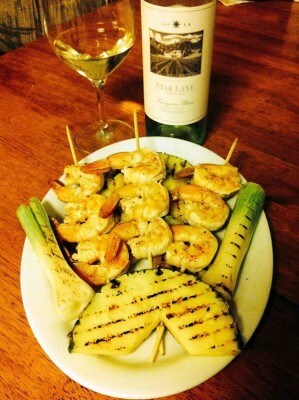 Flip leeks after 4 to 5 minutes then add shrimp skewers and pineapple slices to the grill. After 2 minutes on each side remove skewers and pineapple slices. Leeks will be done as well.